Wow. It’s been a while since I dropped my last mixtape. It’s seems like forever ago that we were saying goodbye to Summer, since now all I can think about are my freezing cold toesies. 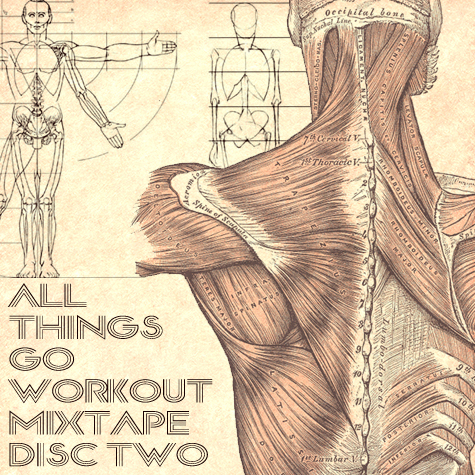 Enter the All Things Go Workout Mixtape Disc 2; here to get rid of your post-Thanksgiving pudge and complement the first edition which you hopefully have been pumping since June. This second installment was crafted back in July, but I’ve been so busy with the new site and school and whatnot that I never got around to posting it. No more excuses. Time to get that gym membership and put on your dancing shoes. From mashed-up bangers to remixes of oldies to, well, DMX, Side B of the Workout Mixtape has everything you need to keep that heart rate up. Oh, and it’s got DMX. So there’s that. As usual, the original album artwork is downloadable above, and the songs are available as a .ZIP and individually. And, if you haven’t already, check out our new and improved Mixtapes page. Enjoy!